State run telecom operator BSNL plans to launch high speed fourth generation (4G) wireless broadband internet services across six telecom circles out of the 20 circles it operates. The PSU will be launching it's 4G services through a strategic partnership with private players like Reliance Jio Infocomm Limited (RJIL) or Russian based telecom operator - MTS. BSNL Chairman and Managing Director (CMD) Anupam Shrivastava confirmed the news, but have not revealed the names of the private players with whom the operator plans to tie up. Reliance Jio Infocomm Limited (RJIL) would be the first possible choice for partnership since RJIL has already signed an agreement with BSNL to lease out 4000 of its mobile towers. Reliance Jio is the only player that possesses 4G spectrum in 2300 MHz band across all 22 circles. The other possible choice would be Russian-based telecom operator SSTL. 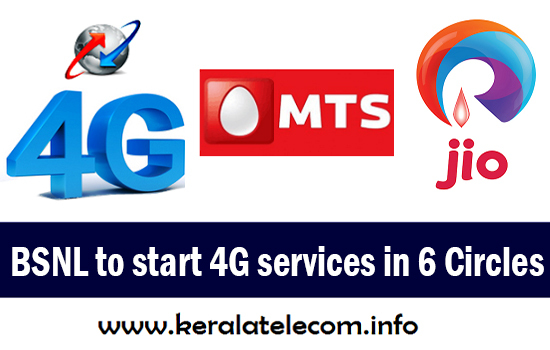 It works under MTS brand in India and has services across nine circles. Operators are eagerly awaiting announcement of the guidelines on spectrum sharing and trading, which is expected to be in place in a month or two. As per reports, BSNL plans to roll out 4G only by March 2016. BSNL has limited spectrum to offer full-fledged 4G services and would need at least 5 MHz for successfully rolling out 4G services and is looking to partner with other telco. BSNL would also try converging its wired and wireless networks to deliver high speed internet. The operator has already started upgrading it's Landline Exchanges to Next Generation IP based Exchanges. The operator will also improve its 3G services, by upgrading the networks. BSNL will also integrate it's 3G, 4G & WiFi network which would enable the customer to transfer to high speed WiFi network, whenever he/she comes under WiFi coverage area. BSNL would be investing around Rs 7000 crore for it's prestigious Public WiFi Project.